First of all, I decided to post this here so I can have one place to send people who want to know my feelings about this topic. You may have heard today that Walt Disney World will no longer be hosting the hard ticket event NIGHT OF JOY. Night of Joy was a celebration of Contemporary Christian Music that happened in the Magic Kingdom and in the last couple of years at the Wide World Of Sports complex. Starting to hear grumblings of the fact that you guys are not putting Night of Joy on any more???? …….is this true? Enthusiasm for Night of Joy has declined since we transitioned it out of our theme parks and, unfortunately, we are unable to accommodate this event given all of the other activities planned in our theme parks. Over the years we have hosted Night of Joy in different venues, and last year was our final event. This year, Christian music will be part of our expanded entertainment offerings during the Eat to the Beat concert series at Epcot International Food & Wine Festival. Contemporary Christian performers, including music legend Mercy Me and Grammy-nominated singer Tauren Wells, will be featured in early September. I will always have very fond memories of being in the Magic Kingdom during the Night of Joy event. For many years in a row, my family and I would head up for the event to celebrate my birthday, which was the week before. Memories of this event will include seeing Amy Grant and Michael W. Smith in the front of the castle and seeing Michael W. Smith on the same stage the Saturday before 9-11. That being said I am not upset that there will be no more Night of Joy events at Walt Disney World. The Disney Company is a business and as a business they have to look at the bottom line. And as the response from @WDWToday said the numbers haven’t been there. Now I do wish that they would have said last year’s event was going to be the last one but I have a feeling the decision was more recently. It also sounds like they are willing to have Christian acts at some of their other events…and the only way they are going to keep them a part of the rotations is if fans go and see them when they are scheduled to perform. So go and do that with a joyful heart. I am a fan of TOMS shoes and found this video from Disney Parks Blog and thought you guys might be interested in it. Enjoy Glenn talking about how he got this sweet bit of Disney history . If your starship can make the Kessel Run in less than 12 parsecs (I’m still trying to figure out how fast that is), set your hyperdrive for the Disney’s Hollywood Studios sector for May and early June, for the 2013 edition of Star Wars Weekends. This year’s Force-filled fun will take place every Friday, Saturday and Sunday from May 17 – June 9, 2013. 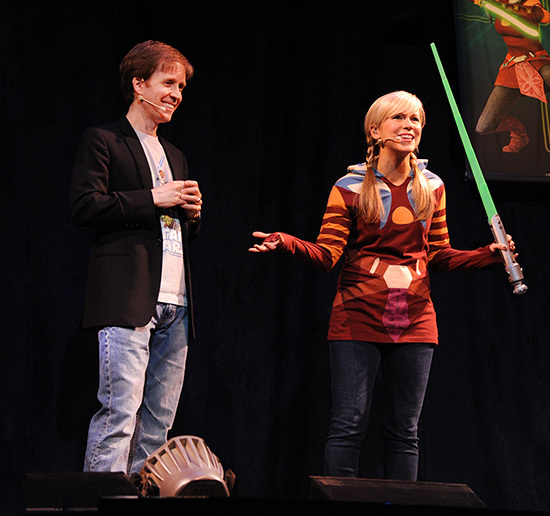 While details are still being planned, we’re excited to announce that James Arnold Taylor and Ashley Eckstein are returning as celebrity hosts for the annual special event. James, the voice behind many of the most famous animated characters in film, television and commercials, is known to Star Wars fans as the voice of Obi-Wan Kenobi on the Star Wars: The Clone Wars TV series. Ashley, who started her show business career as a parade dancer at Disney’s Hollywood Studios, is the voice of Anakin’s ambitious Padawan, Ahsoka Tano, on Star Wars: The Clone Wars. James is the Official Celebrity Host of Star Wars Weekends 2013, and Ashley is Celebrity Host of “Behind the Force,” a live show that takes fans behind-the-scenes in the Star Wars universe. Be sure to program your scanning droids to check here for the latest updates from the Galactic Senate about Star Wars Weekends 2013. For guests who may be considering a visit to Walt Disney World Resort for their very first Star Wars Weekends, here’s a short overview video with our own galactic reporter, “Jedi John” (please note his very stylish “mic saber”). While the celebrity appearances for this year have not been announced (stay tuned for those names in an upcoming post), John talks to some Star Wars celebrities from past events to get their thoughts. WOW to more of the purchase of Lucasfilm then anything else..
Disney CEO Robert Iger, left, and “Star Wars” creator George Lucas, center, celebrate the opening of a theme park ride in 2011. Disney is paying $4 billion for Lucas’ film studio Lucasfilm. Updated at 3:48 p.m. ET: Walt Disney Co. is buying Lucasfilm in a $4 billion deal that brings the best-selling “Star Wars” franchise under the Disney umbrella, with plans to release Episode 7 of the long-running saga in 2015. Disney has long had a close relationship with closely held Lucasfilm and founder George Lucas, including featured attractions at Disney theme parks such as Star Tours at Disney’s Hollywood Studios in Florida. “It’s now time for me to pass ‘Star Wars’ on to a new generation of filmmakers,” said Lucas, 68, in a statement. The cash and stock deal is valued at about $4.05 billion, Disney said. Lucasfilm is solely owned by George Lucas. “This transaction combines a world-class portfolio of content including Star Wars, one of the greatest family entertainment franchises of all time, with Disney’s unique and unparalleled creativity across multiple platforms, businesses, and markets to generate sustained growth and drive significant long-term value,” Disney CEO Robert Iger said in a statement. Lucas will act as creative consultant on the new “Star Wars” film, with more feature films expected beyond Episode 7. The six “Star Wars” feature films have earned a total of $4.4 billion at the box office alone and offer “a sustainable source of high quality, branded content with global appeal,” according to the Disney news release. The deal is subject to federal antitrust approval. In early 2006, Disney struck a deal to acquire “Toy Story” creator Pixar, and in the summer of 2009 it bought the comic book powerhouse Marvel Entertainment. Besides “Star Wars,” the Lucasfilm deal also includes rights to the “Indiana Jones” franchise, though Disney did not elaborate on any plans for that series. “Because Lucas is private, I would assume most investors would be surprised (by the deal). My point of view is that Disney already has a great portfolio and this adds one more,” said Morningstar analyst Michael Corty. “They don’t have any holes, but their past deals have been additive” to earnings. Information from Reuters was included in this report. I was blessed enough to get to know the guys from OFF KILTER when they played the American Gardens stage (American Pavilion) when the acts for the summer concert series weren’t there in 2002. May you be blessed with 15 more years of playing your wonderful music!!! This is the DISNEY PARKS BLOG post…. This July 1, Epcot’s Off Kilter Celtic rock band will mark 15 years of performances at the Canada Pavilion in World Showcase. Off Kilter founder Jamie Holton first started playing the bagpipes when he was 11, inspired by his family’s Scottish heritage and his father’s love for bagpipe music. Entertainment is subject to change. Check the park’s Times Guide for more. I have always been a HUGE fan of NIGHT OF JOY and have many great memories of this event. In case you don’t know what Night Of Joy is it is a separate ticket event that combines the magic of the Magic Kingdom with some of the best contemporary Christian music acts the weekend after labor day. The countdown begins. 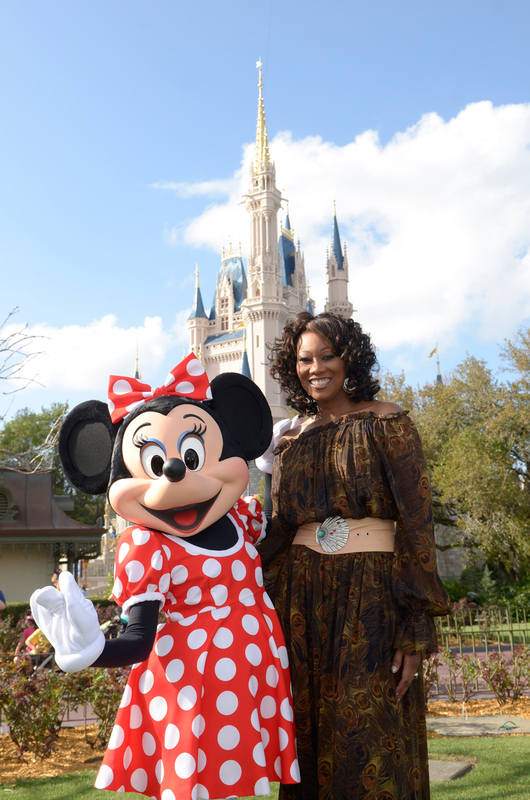 We’re only five months away from this year’s Night of Joy at Magic Kingdom Park – our 30th year. So guess what? Tickets went on sale today! Tickets can be purchased in advance for $52.95 plus tax per ticket and on the days of the event (if available) for $62.95 plus tax. They can be purchased by calling 407-W-DISNEY or at www.nightofjoy.com. Friday, September 7, 2012: Casting Crowns, Chris Tomlin, NEEDTOBREATHE, Red, Francesca Battistelli, Brandon Heath, Royal Tailor, Disciple. Saturday, September 8, 2012: MercyMe, Third Day, Kutless, Chris August, Lecrae, Yolanda Adams, Thousand Foot Krutch and Dara Maclean. Newcomers to Night of Joy, Royal Tailor and Dara Mclean, bring the 30-year roster of artists to 150 acts. Night of Joy is an after-hours event that requires a special ticket. Event hours are 7:30 p.m. to 1 a.m. each evening. While artists perform at several stages, many popular Magic Kingdom attractions also are available for guests. In addition, there are special benefits for groups of 10 or more. Additional information about individual and group tickets is available atwww.nightofjoy.com.